"I Am No Man's Pawn"
Jane is 16 years old and trying to lead a normal life. Which is hard when you can't remember anything. It's even harder when people are trying to kill you - and other people are trying to protect you without you knowing why. Or just messing with your head. Oh, and there are monsters and magic, and you just can't work out what any of it means. Making Fate has not been tagged yet. Help others find Making Fate by tagging it! 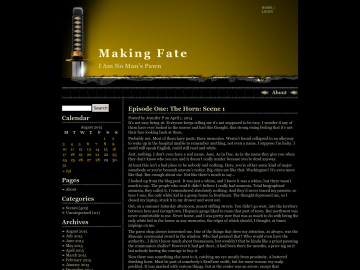 Making Fate has not been reviewed yet. Making Fate has not been recommended yet.